Two female journalists say Mayweather banned them from fight (but PR firm denies). Floyd Mayweather and Manny Pacquiao face off following their weigh-in on May 1, 2015 in Las Vegas, Nevada, one day before their “Fight of the Century” on May 2 at the MGM Grand Garden Arena. 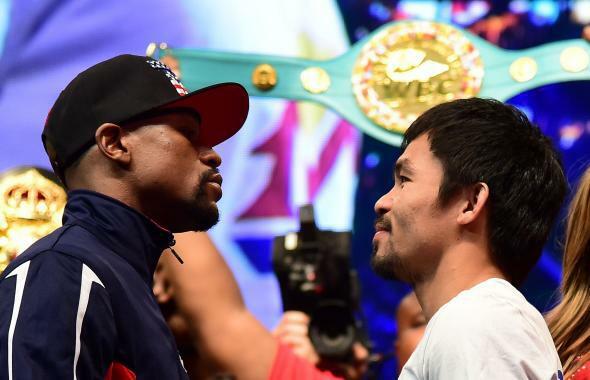 Two of the biggest names in sports journalism say Floyd Mayweather’s team banned them from the Mayweather–Manny Pacquiao fight on Saturday. ESPN and HBO’s Michelle Beadle and CNN reporter Rachel Nichols both took to Twitter to say that Maywheather’s people had axed them from the MGM Grand Arena for the so-called “Fight of the Century.” One key thing both Beadle and Nichols have in common? They’ve both spoken up about Mayweather’s history of domestic violence. Kelly Swanson, who is responsible for Mayweather’s public relations, vehemently denied the accusations, writing on Twitter that neither of the reporters were banned from the event. Later, Beadle said HBO was able to sort out the situation, but she had already gone home after hearing she wouldn’t be able to attend the fight. After hearing my credential was pulled, I went home. Told this morning that HBO was able to get it re-approved late last night. Nichols reminded her Twitter followers that she grilled Mayweather about his domestic violence in a much-discussed interview in September.